Great Smoky Mountains National Park is one of the most (if not THE MOST) diverse national parks in the United States. There are low elevation valleys with teaming wildlife, wildflowers, and wide open fields that are filled with unique history. There are also high elevations the give photographers huge overlooks, old growth forests, and ancient jagged mountain tops. However, one photography feature remains constant throughout the Great Smoky Mountains National Park landscape; waterfalls. Waterfalls can be found all over the park, and can vary in intensity and size. Whether you’re photographing small mountain streams that meander through the hillsides, or shooting a massive waterfall with intense force, the Smokies have the best waterfalls for any kind of weather. In this post, I’ll be sharing the best waterfalls to photograph based on the difficulty of access points and hike. 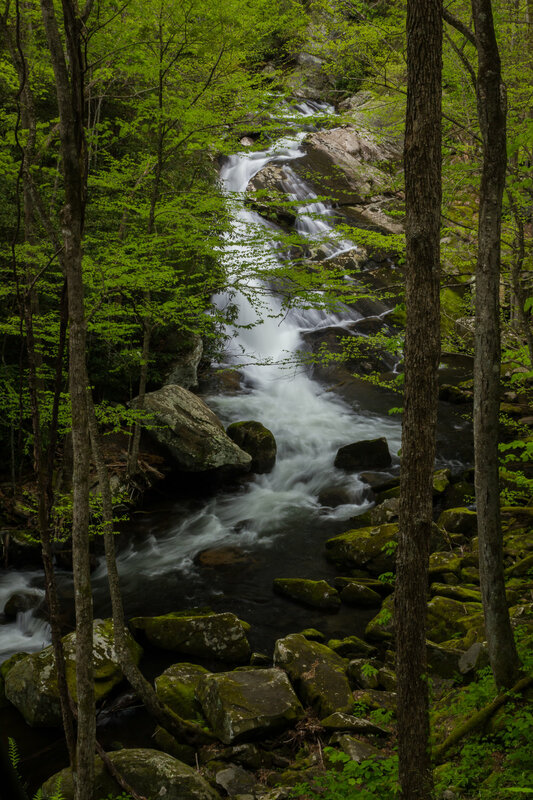 Remember that if you’re using this as a guide for your waterfall photography in the Great Smoky Mountains National Park, be sure to follow the leave no trace principles. 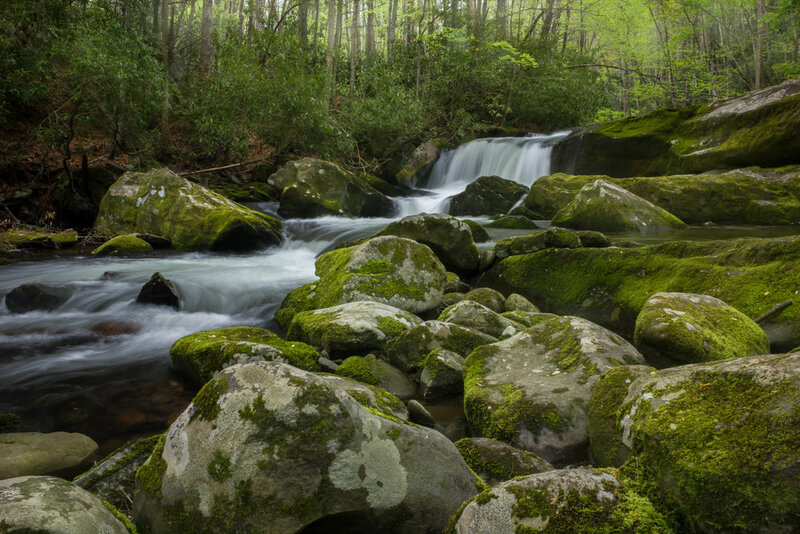 Great Smoky Mountains National Park is an extremely fragile ecosystem that can be greatly damaged by human impact. Stay on trails, follow the rules of the park, and never sacrifice the landscape for a photograph. Lynn Camp Cascades and Falls are along a single trail in the Tremont section of Great Smoky Mountains National Park. When you arrive at the trail head, you will find a large parking area that is usually full of people coming to see the waterfalls. If you follow the Middle Prong Trail, you will quickly see the mountain stream that delivers Lynn Camp Falls. The great part of this hike is that you will find several cascades that are sprinkled throughout the left side of the bank. The first large waterfall you will see is Lynn Camp Cascades, a large waterfall and pours over old, flat rocks and then quickly turns, creating a unique flow of water that is both intense and beautiful. There is a very easy access viewing area directly on the trail for you to easily compose a stunning composition. As you continue to walk along the trail, which has gentle elevation gain and a wide, flat walking area, you’ll continue to pass several unique cascades that you can use for photos. However, the best waterfall to shoot is Lynn Camp Falls. It is a tiered waterfall that has several different compositions to shoot that look different depending on the intensity of the flow of water and season. You can continue to hike along Middle Prong Trail as far as you’d like, but these are the two most prominent waterfalls to photograph in this area. Take your time exploring the falls, and remember to leave no trace so other photographers can come and photograph the same amazing scene you did. Mouse Creek Falls is located on the North Carolina side of the park, so if you typically stay in Gatlinburg, you’re going to have a good drive to get to the trail head. The trail you’ll be looking for to access Mouse Creek Falls is called Big Creek Trail. The trail itself has some elevation gain, so be sure you are mentally and physically prepared for it, although most fitness levels can do it. After you have gone 2.1 miles on Big Creek Trail, you’ll come to an open area where you’ll find Mouse Creek Falls. Here, you can see the long, meandering cascade stumble and wind through large rocks and boulders as it makes it way down to Big Creek. It’s a really beautiful waterfall that allows you to creatively capture movement and directional changes. If you want to take your time getting back to your car, a great stopping point is at Midnight Hole. This is an area that has a small waterfall, but also has some chances of creative long exposure photography. It’s especially good in the fall when colorful leaves float and dance on the water’s surface and create lines and patterns in extreme long exposure photography. However, if you choose to stare back into the face of Ramsey Cascades Trail and defeat it, you’re rewarded with a truly stunning waterfall. At roughly 100 feet in height, Ramsey Cascades creates intense force which has created a beautiful pool of standing water at the bottom of the falls that eventually leads to another cascade that ventures down the mountain. You’ll definitely need an energy bar after this hike, but stay at the waterfall as long as possible to take in its glory. You earned it, after all. If this short list of waterfalls tickled your fancy, there are plenty more that you can explore in Great Smoky Mountains National Park. In the Spring of 2020, I’m leading a Great Smoky Mountains Spring Photography Workshop that will visit several waterfalls and other features in the park. We will learn how to use camera settings best, in-field workflow, creative compositions, and even some post-processing work. If you’re interested in learning more about the workshop, follow this link!